Tangled, a painting inspired by the difficult times. When I got pregnant, I knew about it the day right after conception. I was getting flashbacks to my own childhood, memories I’d long forgotten, impinging on my consciousness with complete clarity–smells, sights, sensations. I’d never experienced anything so strong before. So I figured it out. Along with the flashbacks, I was getting plenty of instructions about delivery/childcare that were felt/read/intuited, sometimes hard to convey to others. I wanted to go as natural as possible (I had an epidural in the end). I wanted to breastfeed (turned out I couldn’t–the palate defect prevented this), and wanted to do all the “do”s in the natural, conscious parenting handbook… which I alone was reading. Tl;dr, when the baby arrived, I was thwarted in almost everything I wanted. No one else had been getting the info I had, nor was understanding its importance to me. I cried. I raged. The difficulties piled on: the lack of sleep made worse by lack of skilled helpers for the baby’s special care, and my undiagnosed hyperthyroidism, exhaustion, and lack of support during the night. I was the only one who read books on babycare, and was adamant on keeping the child away from processed foods, endocrine-disrupting chemicals, and screen media. I had to process my brother’s sudden, violent death, my mother’s advancing Alzheimer’s, and strained relationships everywhere. It was an exacting, exhausting, and extremely dark time in my life–Traditional Chinese medicine professionals and aura readers have been able to read the damage from this period on my physical body. I was tired to the bone, quite literally–getting multiple cavities in my teeth when I’d never had them in my life. I was unhappy and aware that I was unhappy, feeling bereft of support from the areas I wanted it, breaking down oh so often. Things only got better when I left behind those whom I felt draining me. I had to get selfish–to be honest about what I wanted, about what made me happy, where I could get that feeling, and in whose company I couldn’t feel it any longer. It was all very difficult to do, but I was slowly guided on it by little but important things that made me happy–time to myself, physical ease, and the freedom to explore and practise new ideas. The flashbacks from childhood and an inner child meditation had conveyed, on a visceral level, the extreme importance of being a healed parent so that my child could develop in a supportive and happy environment. It is nigh impossible for a damaged parent to raise an undamaged child, and I knew what damage was and what it feels like. It is traumatic, it warps outlooks and attitudes–whatever limiting beliefs the parents hold will be passed on to their child. “I cannot”s are learned in childhood. They were learned in mine. I didn’t want this to happen to my child. But even the phrase “limiting belief” was not yet in my vocabulary–so I couldn’t explain it. I also didn’t want the child to be programmed by TV, TV values, and the mindless consumer culture of quick, outward, material gratification. But this is still hard to explain to people in the mainstream. Imagine doing this when you’re underslept, desperate for help, and having unconventional standards of what you want around your child. I more-or-less managed, in the end, to expose the child to very little television in her first three years. All media exposure was greatly moderated, explained, and balanced with imaginative, sensory play, being outside, and encouraging her to learn. Emotions were so important–I let her express them, I honoured them–let her determine her autonomy with what she wanted to share, with whom and when, and that included her toys, food and physical closeness. I invented and played games with her, allowed negotiations, and used honesty all the time. I tried never to use convenient lies, emotional manipulation or fake (societal) rules, like accommodating strangers against her own will for the sake of appearances, hers or my own. I felt that everything she would get in her childhood needed to be supportive but overall, empowering… different from many situations I remembered from my own childhood. I felt, but didn’t know consciously that I needed to heal from my own childhood to do these things. I was simply at the stage where I had started to realise where I’d been hurt, and what burdens I’d been covering for decades, leading to a plethora of ailments now too much to bear. A friend introduced Louise Hay’s You Can Heal Your Life to me, and I was skeptical even as it kept seeping into my thoughts and consciousness. It made such simple sense that it was easy to dismiss, but now I couldn’t. I’d always carried the weight of the world on my shoulders. In my working life, my shoulders had often ached like mad, often adding a stiff neck (my Buddhist fundamentalism) and headaches (living too much in the logical mind). I’d been raised in a misogynistic culture and outlook, and had often hated my creative impulses that made me different and put me on “unproductive” career paths. And I’d long had ovarian problems and bad menstrual cramps (problems in the sacral area echoing the denial of my female creativity). I’d had lifelong nasal allergies, possibly from always suppressing tears and emotions. The emotion-denial often conveyed in Buddhism didn’t help me now either. Bone tired? Yep, I had holes worn into my teeth for the first time in my life. The literal, insomnia-causing wake-up call was the hyperthyroidism, giving me shaky hands, anxiety and months of never-enough-sleep. I had constant exhaustion, and feelings of failing my child–a hell that I won’t even wish on my worst enemy. The thyroid issue was an ailment of the throat chakra, an imbalance reflective of my constant cries for help, sometimes screaming for it in the middle of the night but not being heeded. I even experienced guilt for having any needs at all–a ridiculous emotional place for a new mum to be. It was emotional and physical hell. All I can say now is that I got out of this period of my life. It was a journey, and it was hard, and I had to learn a lot of difficult lessons fast. It was also the time I learned about my invisible helpers and how to put more stuff into their hands. I needed to ask and to put myself in the company of those who listened. I learned I had to trust, honour and love myself before I could dare help others–this is often not conveyed in inspirational books and it should be, for those being diminished/ignored/manipulated or taken advantage of. It’s all well and fine trying to be a Bodhisattva until you realise you’re still human, with physical limits and boundaries of autonomy that should be respected. Women need to learn this. Asian women really need to learn this. 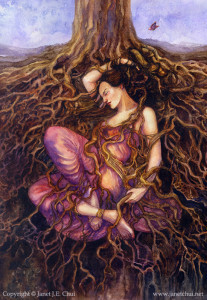 I loathe stories of selfless women, and think the lesson behind The Giving Tree should be looked at with suspicion–these stories set impossible standards for women, framing perfect love and the ideal female as one who gives at one’s own expense, even continuing in the face of abuse and exploitation. Yet it is also a spiritual lesson to value oneself, one’s body and one’s time here. Not often enough are people taught to love themselves–it doesn’t mean ballooning one’s achievements or being blind to one’s own faults–it means self-knowledge, acceptance, a willingness to work with oneself, and to allow one to feel, to desire, to be. Self-love will not allow someone else to diminish your flame or your own right to happiness. Self-love wants and can allow only self-autonomy that also allows others their own. It impinges on no one’s rights but respects them. Self-love makes one whole and frees you from the expectation of others, and in turn lightens your expectation of them. Control over others wanes in importance. Self-love is a precious cycle (as opposed to “vicious”) leading to more happiness and healing. Self-love and healing also make one aware of one’s dependencies and addictions (even those “approved” by society), and so help prevent these being passed on to the child. We live in a world now where many powers and people around us vie for control one way or another–fattening bank accounts with addictions, poisons, ill health, fear, ignorance and escapism. The materialistic mainstream consumer culture obscures and confuses real, lasting ways of achieving well being. So many “safe” products offered on the shelves of supermarkets and in “personal care” products are chemical poisons. For whose benefit? The key word is consciousness. More of us need to be conscious beings, conscious parents, and conscious healers of ourselves before this world really changes for good.